Slice thin slices of roast beef, turkey or ham during the holiday meals with the Pure Komachi 2 Slicing Knife! 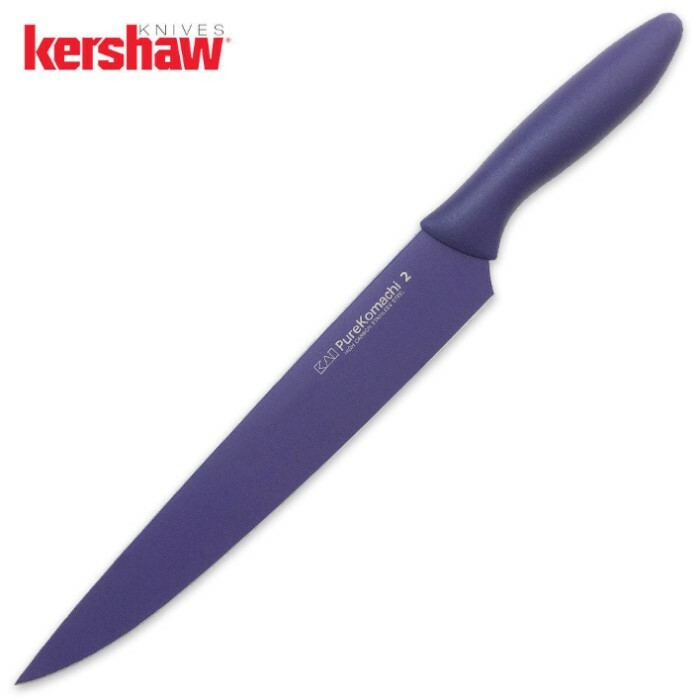 The blade and handle both feature bright purple coloring, which is sure to add joy to any food-centered festivity. High-carbon stainless steel goes into making the ultra-sharp 9-inch blade, in a narrow shape with a precise point. The Pure Komachi 2 Slicing Knife is held by a lightweight, rounded handle that is comfortable to hold. Each knife has high-carbon stainless steel blades that are coated with a bonding liquid that creates a corrosive resistant surface that is easy to clean and sanitize. The slick blade surface cuts through meats and vegetables easily. 6 1/2 in. blade.